Dr. Garcia has been practicing in Lemoore since 1993, when he arrived at the Naval Hospital, located on Naval Air Station Lemoore. He attended the U.C. San Diego, receiving a Bachelor of Arts degree in Psychology in 1989. He went on to attend the Southern California College of Optometry, where he earned his Doctor of Optometry degree in 1993. 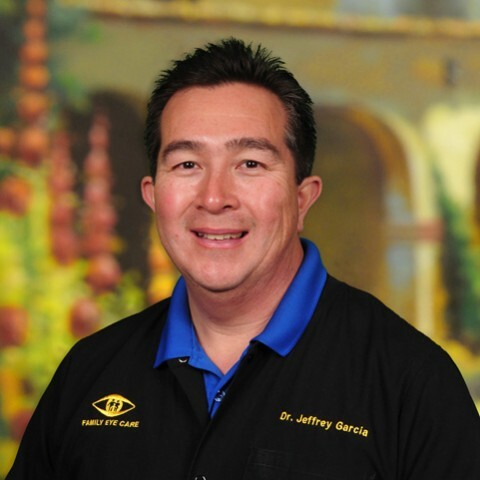 Dr. Garcia has been practicing at Family Eye Care in Lemoore, ever since. Dr. Garcia is proud of his Naval Service. He affiliated with the Navy Reserve right after graduating from high school, in 1985. He spent eight years serving as a Hospital Corpsman with the 4th Marines. He was commissioned as an Officer in the Navy Reserve while attending optometry school on a Navy Scholarship. He has served over 26 years as a Navy Reservist, currently as a Captain, in the Medical Service Corps. He is very active in his Community, having served as President of the Chamber of Commerce Board of Directors, the Lion Club and he is currently serving on the Lemoore Planning Commission. One of his passions is providing eye care to those less fortunate. He volunteers his time to provide eye exams and glasses to those in need in the Kings County area on a monthly basis. He also travels annually abroad providing eye care services and eye glasses to the underserved. His volunteer efforts through the Lions Club and other organizations extend from North America to South America and Asia. His years of volunteer work with tens of thousands of his patients from around the world give him a great deal of experience from which to draw from in working with patients in his own practice. Dr. Garcia is certified in the Treatment and Management of Ocular Disease and in the treatment of glaucoma by the State of California Board of Optometry. Dr. Garcia was honored as the Lemoore Citizen of the Year in 2010 and selected as the Armed Forces Reserve Optometrist of the year in 2011. Dr. Garcia is a member of: The American Optometric Association, California Optometric Association, Kings-Tulare Counties Optometric Society and the Armed Forces Optometric Society.